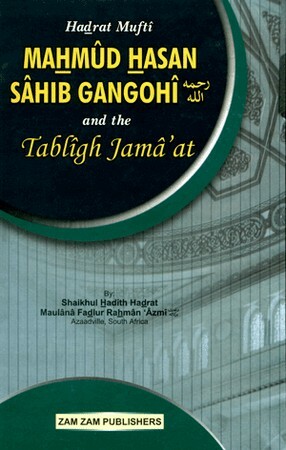 The book contains a collection of sayings, advices and verdicts of the Mufti Mahmud Hasan Gangohi, senior Khalifa of Shaikul Hadith Maulana Muhammad Zakariyya Muhajir Madani (may Allah be pleased with him) concering the Tabligh Jamaat. Reading through this book will, Allah willing, prove beneficial for people engaged in the work of Tabligh. It will also be valuable for others as well as those interested in learnign about the great Mufti. Those who knew wil realize the importance of this book, which highlights the remendous benefits of the tablighi effort. Allah Most High is the One Who inspires people to do good. I found this book is very beneficial for any muslim as an eye-opener on the contributions and the effort of Hadrat on the Tablighi Jamaat movement and also it can establish love and affection towards this noble effort which can changes the quality of deen inside all the Muslims all over the world.